Nestled Between Sprawling Mountains & Perennial Streams Is An Exquisite Homestay In Karjat! Imagine breaking away from the dull and the mundane and stepping into a world where birds chirp and insects sing atop lush green trees; where butterflies whisper sweet nothings to colourful blossoms; where bubbling waters of a brimming stream meander carefree all along; and where the night sky shimmers with a thousand twinkling stars. Imagine a hideaway so serene, invigorating and pure where a few moments spent with family, friends and loved ones, become lasting memories…a place truly meant to be ‘for you, me and us’! 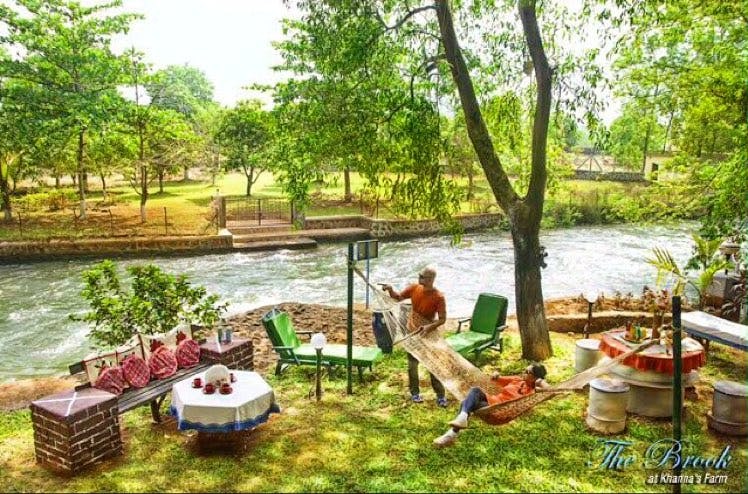 Located in the scenic countryside of Karjat, in a tiny village called Vaijanath en route to the Tata Power Plant, is The Brook—a private property built on an acre of land overlooking the Western Ghats on its one end, while touching a perennial, flowing river on the other. Primarily planned as a private family getaway by the Khanna’s, this magnificent villa, teeming with artefacts, paintings, sculptures and souvenirs from the world-over, is available on short lease, suiting your requirements. Book it for a day picnic and let your children be one with nature; see them breathe fresh, unpolluted air; encourage them to indulge in outdoor activities; treat them to garden-fresh food. Rent it out over the weekend and revive bonds with your friends; trek the nearby mountains, play a game of badminton or take a dip into the river. For newly-weds, the place transforms into a perfect intimate escape where couples can relax on hammocks, laze in the sun, drop their feet in the rivulet and stare at starry skies at night. Summers, winters and monsoons alike, The Brook won’t fail to please you. The villa is a spacious, fully-furnished house with a large living room, a gaming area for board games and a fully-operational kitchen-n-dining area on the ground level, while four large bedrooms and a vast open terrace occupy the floor above. Characterised by a high ceiling, numerous windows for ample light and ventilation and scenic views, the villa appears like a bright marigold flower amidst a cluster of fruit-bearing trees. But what distinguishes the house from many others are the carefully and painstakingly placed art and artefacts. The Khanna’s have an undying love for paintings, sculptures and knickknacks brought back from their many travels within the country and abroad and they take pride in displaying them. These displays give the house a sense of being a home, especially to first-timers. Surrounding the villa is the well-manicured lawn, with an outdoor bar, swings, tables, benches and hammocks. The second villa at The Brook is an equally impressive home with 3 bathrooms and 3 bedrooms with a view of the coconut trees on one side and the mountains on the other. Both the villas are on the same property adjacent to each other. The lawn overlooks the sparkling stream which comes straight from the mountains. A trip to The Brook is incomplete without taking a dip in the pristine waters of this stream!